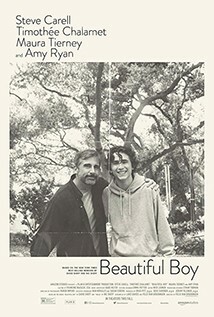 Based on the best-selling pair of memoirs from father and son David and Nic Sheff, ‘Beautiful Boy’ chronicles the heart-breaking and inspiring experience of survival, relapse, and recovery in a family coping with addiction over many years. Steve Carell plays New York Times and Rolling Stone journalist David Sheff (author of the eponymous memoir), and Timothée Chalamet (‘Call Me By Your Name’) is his gifted teenage son, Nic Sheff, a sensitive lad whose initially casual drug use morphs into a toxic cycle of lies, guilt, recrimination, and lawlessness. The leads are superb, especially Chalamet who is electric and screen-grabbing, but stunningly vulnerable and real. They are buoyed by Amy Ryan as Nic's mom, Maura Tierney as his stepmother, and Lisa Gay Hamilton in a moving cameo as a parent whose unconditional love couldn't save her child.